Thinking of breeding hamsters. Good breeding ethics start before any attempt at breeding hamsters is made. Prospective hamster breeders will learn as much as possible on the subject of breeding, before embarking on any hamster breeding project. A good breeder will ensure adequate provisions are put in place, above and what is necessary for routine hamster care, and allows the owner / breeder to carefully consider, in readiness to take on the responsibilities of being a reputable and responsible hamster breeder. Before deciding on breeding hamsters a host of things you need to evaluate. Breeding hamsters for the intention of making more hamsters, or making money out of them, is not an ethical reason for breeding. Raising a litter of hamsters needs constant care and attention once weaned, if you aren't able to handle all the baby hamsters daily, then you shouldn't breed hamsters. If you choose to breed more than one litter of pups at a time, you need to factor that into your breeding schedule as well. 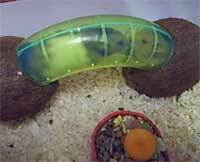 Good breeding is leaning as much as possible about hamster breeding, before you start breeding hamsters. Educating your self on breeding does not stop at: oestrus cycle: 4 days, gestation period: 16 days, weaning: at 21 days etc. There is a lot more to breeding hamsters than this. You need to be well educated in all aspects of breeding. More hamsters equals more time, if your females have large litters, do you have time to handle each and every pup on a daily basis? It is very important to socialize baby hamsters, so they are well socialized and tamed before leaving you. A good breeder will not compromise on this issue. In addition to socializing and taming hamsters, it is important to know each baby hamster individually. This is important so you can observe any personality changes in the hamster, as this could indicate a health problem. If you have a lot of litters at once, it isn't possible to get to know each baby individually. A plan must be in place for the disposition of any litters of hamster pups, prior to any breeding. Destinations reasonably well assured, whether into private homes, or trust-worthy pet shops. A responsible hamster breeder will pledge to take back, or help to place, any hamster / hamsters or pups that he has bred, no matter how old they may be. A hamster breeder must be prepared to supply all the information for adequate housing, food and care for every hamster that he places. Every breeding needs to have a specific goal as well as to improve on that species. Irresponsible breeding won't better the species. Do you know how inheritance works? This is not just colour genetics, but also how other health defects, temperaments, and other characteristics can be inherited from the parents. No professional breeder is fallible! We can, and do make mistakes sometimes. Things can go wrong, things beyond our control. Before you start breeding, you need a vet to be easily located at any time. As with a hamsters birth, any birthing complications that may arise usually happens at night when vets are closed. Not every one is cut out to be a breeder. There lot's of things to consider before breeding hamsters Don't breed from your hamster if you have no information on the health and fitness of both the parents, i.e. hamsters bought from pet shops. Discontinue the breeding of animals that consistently produce offspring that have a defect, or disorder which is detrimental to the species. Those who want to be a responsible and informed hamster breeder will do their homework and research the breed of choice. There are more than enough hamsters in this world, and many are euthanized long before their time. Take positive steps to make sure the hamsters you breed will never end up in shelters or a rescue. 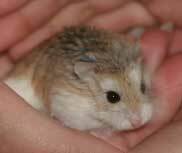 The Syrian hamster is the hamster that most people associate with the word Hamster. The Syrian Hamster may sometimes be referred to as the Golden hamster. Other coat colors and variations may be referred to as the Panda bear, or Black bear hamster. The long haired Syrian hamster is sometimes referred to as the Teddy Bear hamster. The long haired male Syrian has longer fur than the long haired female Syrian. Preferably a skirt of longer fur around the rear end. Whilst the long haired females usually have fluffy, or tufts of hair and no skirt. The Syrian hamster makes a good family pet. Hamsters are ideally suited to both children and adults. If you wish to keep more than one hamster together in the same cage then consider the Dwarf hamsters. Dwarf hamster may be kept together. Baby hamsters for sale from a breeder. buying baby hamsters. syrian hamsters for sale. baby syrian hamsters for sale. 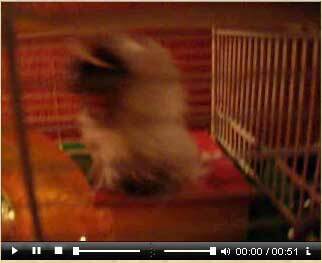 videos of hamsters for sale. pictures of baby hamsters for sale. 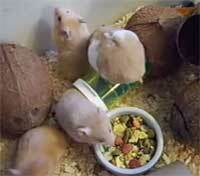 We have 20 years experience of breeding hamsters and we breed for health and temperament. All our hamsters for sale are Tame and non aggressive. As a breeder of Syrian hamsters I have the occasional litters of baby Syrian hamsters for sale. Hamsters have to be collected in person as I will not ship my hamsters'. Different colour and coat variations are available for sale. Occasionally long haired hamsters, but mostly are short haired male and female baby hamsters and average 5 week of age at the point of sale. Please note: Hammysworld are "Not" commercial premises (shop) Viewing and pick up is by appointment only. So please Telephone: or e.mail to query availability. I operate a waiting list arrangement if there are no pups for immediate sale. However, if you are prepared to wait then mail me with your details to be added to the list and I will contact you as and when pups become available. Here you can learn all about baby hamsters. What to feed baby hamsters. The life of a baby hamster. When to take baby hamsters away from the mother.